We just got word that fugitive Shawn Christy was captured in Ohio not far from where he apparently wrecked yet another stolen vehicle on Sunday. Christy was in Adair County last month. He apparently came in search of local native and Medal of Honor Recipient Dakota Meyer. He apparently broke into Meyer’s home then stole another vehicle before heading to West Virginia. They are celebrating in Mansfield, Ohio because of the capture. As I watched a press conference held at an Ohio State Highway Patrol post announcing Christy’s capture, I couldn’t help but think of all the time they could have saved and potential danger they could have avoided if they had given us the same chance they gave Mansfield, Ohio. By “they,” I mean the federal agents who headed up the long search. From the spokespeople at the press conference, it’s obvious they made locals aware of the situation from the beginning and they worked with the press to get out important information. One US. Marshal, who isn’t identified, even thanked the press for their efforts. He and another Marshal made several comments commending local law enforcement for their teamwork. He noted that a police canine picked up Christy’s scent and it was because of “boots on the ground” that he was captured. 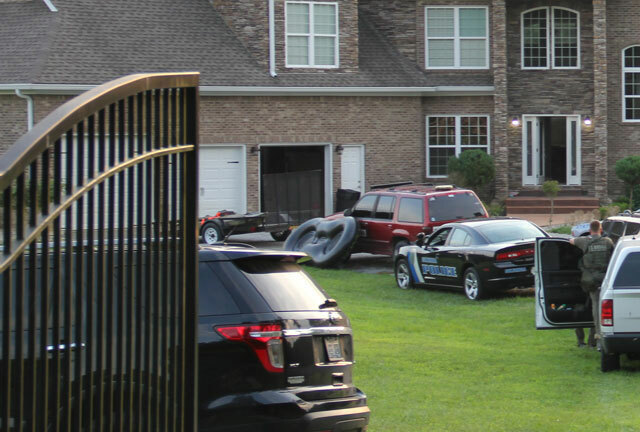 In contrast, when federal agents were in Adair County they rarely even contacted local law enforcement, and when local law enforcement beat them to Meyer’s residence following the break-in, they were told by a U.S. Marshal that they wanted a media blackout. I was on the road in front of Meyer’s residence when a U.S. Marshal requested that I leave and refused to answer questions. Our newspaper broke the story that Christy was here in search of Dakota Meyer. The agents in charge of the investigation never released that, nor did they confirm it. As far as I know, they still haven’t said it, but it’s true. In fact, the FBI issued a release that said Christy possibly dumped a car in Greensburg. It wasn’t in Greensburg, it was in a rural area near the Adair/Green County line close to Meyer’s residence. For those of us who live here, that’s a big difference. Every time we asked for an update, we got a one-liner that the search would continue until Christy was apprehended. The people of Adair and Green counties would have been happy to have cooperated by sharing leads and locking doors. Our local media would have been happy to pass along important information. And our local law enforcement would have loved to have searched the local woods and fields, and some of them knew the area pretty well. Maybe, just maybe, if the people who came into Adair County had been as forthcoming with information as the people in charge of the Mansfield, Ohio search were, this press conference could have been held at the Kentucky State Police post in Columbia weeks ago. The folks in Mansfield, Ohio probably would have never even have heard of Shawn Christy. Their schools wouldn’t have cancelled this week and their people would have slept much, much better.